Abandon the Web! : Croquet project: It's a very fine day! What if we were to create a new operating system and user interface knowing what we know today, how far could we go? What kinds of decisions would we make that we might have been unable to even consider 20 or 30 years ago, when the current set of operating systems were first created? More traditional distributed systems replicate data, but try very hard not to replicate computation. But, it is often easier and more efficient to send the computation to the data, rather than the other way round. Croquet is great research. The system makes full use of its foundation, Squeak, an implementation of SmallTalk. 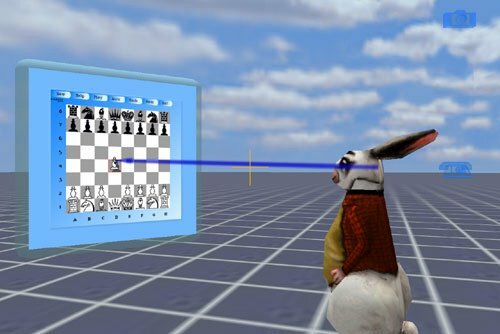 Today Squeak is a niche technology—will Croquet manage to bring it into the mainstream and make a big impact? Indeed...a very fine day...but it certainly isn't today and it won't be for a while. The idea is very similar to the internet e-village which was a very promoted idea a while ago, but still hasn't caught on as much as the hype it was enveloped in. I idea I strongly agree with...providing an open platform where the user interacts with the platform and doesn't feel the current difference between using a browser, an email client and other software. Also the collaborative part seems to be in with the current flow of the web into social-networking and social-software. However there are some problems. Not so much technological problems but user problems... I think it's too much of a leap in both technology and the way the user interacts with his environment to be adopted by a wide range of users in a short time. It will definately be something for the future but bear in mind that most users don't even know the difference between flash pages or ajax, most of them don't know what the little lock icon in the browsers mean..but they think their communications are always secure and anonymous. A lot of them would be scared of the idea that other people could see their environment and watch what they're watching. The web, software and users must still evolve a bit beyond their current preconceptions of the computer world until something like croquet will become feasible. It may be used by people in the IT industry but those people already know how to make the most of their online experience. Before trying to invent a new platform we should be working on and learning from the current platforms since they have stood the test of time.